It’s way too soon to be declaring winners and losers from the 2017 NHL Entry Draft, and it’s even too early to be ranking the results. However, fans of all 31 teams have an insatiable appetite for immediate feedback and evaluation. Ask and you shall receive. Ask again a year from now — with another season of hindsight — and these grades will definitely be different. As of today, I feel a handful teams enjoyed tremendous success, upwards of a dozen others were more hit than miss, and only a half-dozen wound up whiffing for the most part. I’ve decided to recap the draft team by team — in order of their first pick — and give out grades along with a brief analysis and comparison to my mock results. At the end, I rank the teams as per your request and await the inevitable debates. 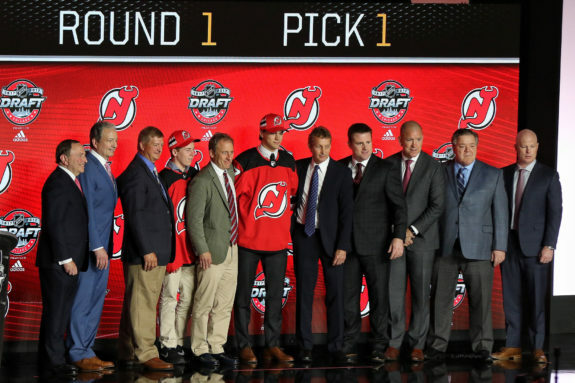 The New Jersey Devils were the big winners in the draft lottery and did quite well for themselves on draft weekend too, starting with Nico Hischier at first overall. ANALYSIS: The Devils went Nico over Nolan at No. 1 and that decision may ultimately determine the success or failure of their 2017 draft. I would have gone with Nolan, for what it’s worth, but that could still be a win-win. I really liked New Jersey’s first five picks and thought the Devils were killing it to that point. The latter six left a bit to be desired, but a few of those prospects are intriguing to say the least. All in all, a good haul that should produce a handful of NHL players. Popugaev and Walsh could be steals at those spots. The results were somewhat similar to my mock, with the Devils selecting four defencemen — including three in a row at the end, as predicted — but I’m shocked they didn’t take Artyom Minulin in the seventh round. Also surprising that Dayton Rasmussen went undrafted. I had the Devils selecting both in the top 100, but time will tell if those two prospects would have been better than New Jersey’s late-round picks. 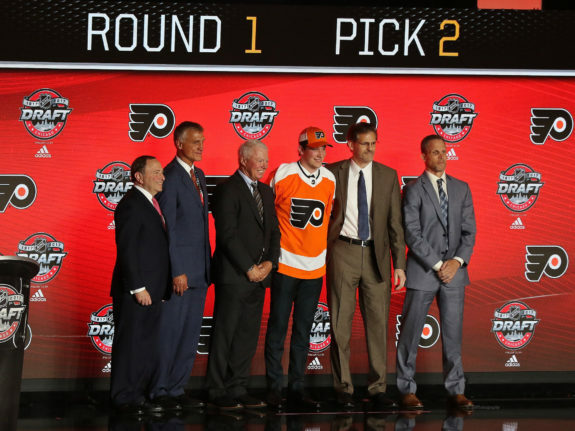 The Philadelphia Flyers had an easy decision at No. 2 with Nolan Patrick and were active in trading up to get their other targets in the top 35. ANALYSIS: Mixed emotions about Philadelphia’s picks. Really like Patrick and Ratcliffe — they are going to make great Flyers, and Strome could too if he pans out as a potential steal in that spot. I’m torn on Frost and look forward to tracking his development next season, but he probably wouldn’t have been my pick there over Klim Kostin and Eeli Tolvanen, among others. I didn’t like the trade that got the Flyers that pick either, shipping Brayden Schenn to St. Louis. The Flyers really didn’t need to draft another goalie — they are loaded at that position, in terms of prospects — but Ustimenko could be another good one and was presumably their best player available at that spot. Sushko and Cates have upside too, while the latter two picks were foreign to me. If Frost and Strome prove to be more boom than bust, this could be an A+ draft for Philadelphia, but I’m giving the Flyers a B+ for now. The biggest surprise here, to me, was that the Flyers didn’t go back to the WHL after picking Patrick. Philadelphia has had a tendency in recent years to reach on WHL forwards in the middle rounds and somebody like Jordy Bellerive or Jayden Halbgewachs would have fit the bill (both went undrafted). 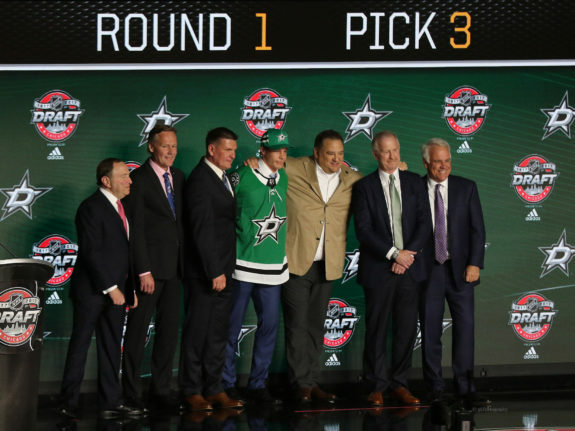 The Dallas Stars took the draft’s top two-way defenceman in Miro Heiskanen at No. 3 and made the most of their first three picks. ANALYSIS: Those first three picks were worthy of an A, while the next three were closer to an F (or at least a C) in my opinion. I really liked the Ferguson pick in the seventh round, but the Stars have since traded him to Vegas as part of the package for Marc Methot, who will obviously help Dallas more in the present. As you can see below, I correctly predicted Heiskanen and Oettinger to Dallas in the first round. Robertson was gone by 39 in my mock, but I would have definitely picked him over Popugaev had both been available. Jim Nill was getting his men to that point, but Hawel, Peterson and Davis will have to win me over next season. For now, it’s a B. The Colorado Avalanche selected a tier-2 junior player in the first round for the second straight year, taking offensive-minded defenceman Cale Makar at No. 4 after getting talented forward Tyson Jost at No. 10 in 2016. 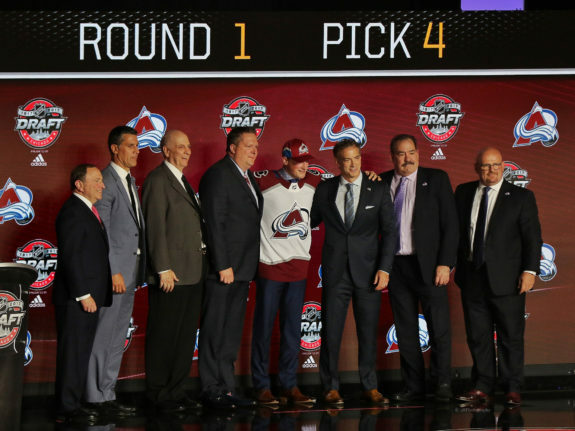 ANALYSIS: I have been critical of Joe Sakic’s competence as a GM — mainly for his trade-deadline moves, or lack thereof — but Colorado’s scouting staff is deserving of full marks for this draft haul. Makar and Timmins are really going to bolster the Avs’ blue line, and Leivermann is no slouch either. Henry, Shvyryov and Smirnov all have steal potential as high-skill forwards. Kvaca is the wild-card here and I’m a bit surprised the Avs didn’t target one of the bigger-name goalie prospects — especially after losing Calvin Pickard to Vegas — but there isn’t much to complain about when you go down that list of picks. 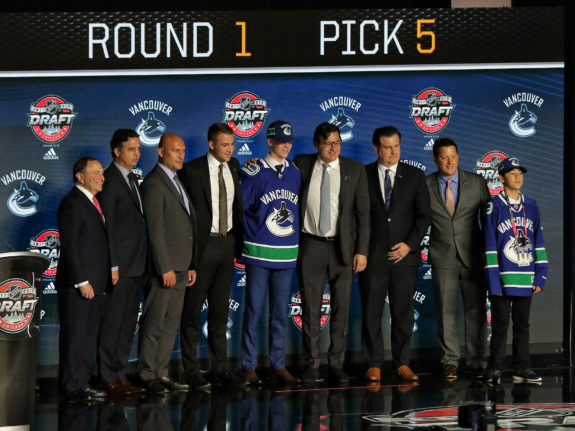 The Vancouver Canucks enjoyed a successful decade thanks to Swedish talents and hope to continue that trend with the selection of Elias Pettersson at fifth overall. ANALYSIS: The Canucks took Pettersson, in part, because of his chemistry with Jonathan Dahlen, the prospect that Vancouver acquired from Ottawa for Alex Burrows. I like Pettersson and had him to Vancouver in my sneak peek mock, so I didn’t mind that pick at all. Truth be told, I’m a big fan of Vancouver’s first four selections. The Canucks have always been good at drafting goalies and we can probably add DiPietro to that list. Lind and Gadjovich have top-six potential as scoring wingers. Rathbone and Palmu are likeable prospects too, while the Gunnarsson and Brassard selections were underwhelming to me. My mock was more promising for Vancouver, but most those prospects were gone by the time those picks rolled around. 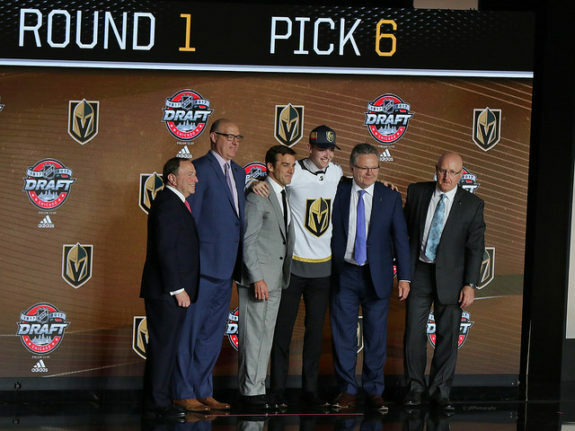 The Vegas Golden Knights made Cody Glass their first ever pick in the entry draft, then selected two more exciting prospects in the top 15. ANALYSIS: I liked my mock for the Golden Knights, but I like the reality even more. Those first four picks were absolutely awesome. I’m looking forward to seeing how Leschyshyn bounces back from his injury and what he can bring to the Memorial Cup host team, but he probably wouldn’t have been my pick at 62. After that, the next four picks — from Ronbjerg to Dugan — really impressed me again. If the draft ended there for Vegas, it would have been worthy of an A+. I’m not saying those last three picks were necessarily bad, but they weren’t as good as the previous four or the first three. Still, coming away with seven great picks from a single draft is definitely deserving of an A. 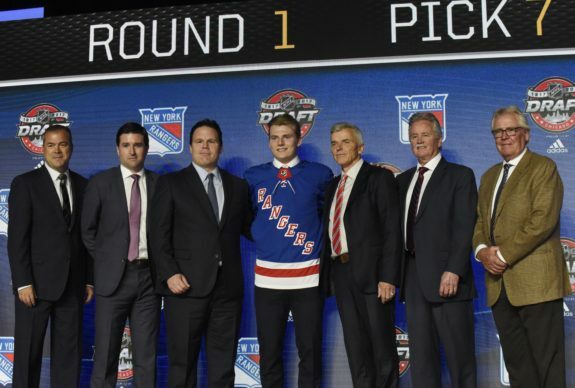 The New York Rangers were one of the more active teams on draft weekend, but time will tell whether that was a good thing after trading up to take Lias Andersson at No. 7. ANALYSIS: I like Chytil more than Andersson, but they were both reaches at those spots and it didn’t get any better from there for the Rangers. Lakatos is intriguing, I didn’t mind that gamble, but Chytil is the only prospect that actually excites me from the Rangers’ draft haul. The Rangers hadn’t acquired the seventh overall pick at the time of my mock, but I’m shocked they didn’t select Casey Mittelstadt. That would have been my prediction and my pick, especially after trading away Derek Stepan. Getting Mittelstadt and Chytil out of the first round would have warranted a C, but the Andersson pick and the overall mediocrity made it a D.
The Buffalo Sabres snagged one of the draft’s most skilled forwards at No. 8 in Casey Mittelstadt, a raw talent that may be a few years away. ANALYSIS: The Sabres were another team that got off to a really strong start before slipping a bit. Mittelstadt was the right pick there — even though I had Buffalo passing on him to take Owen Tippett in my mock — and Luukkonen was my favourite goaltending prospect in this draft (yes, ahead of Oettinger). Davidsson has nice upside too and I liked Weissbach as a seventh-round flyer. Laaksonen was a total unknown to me (and most), and Bryson was another surprising pick that could go either way. Mittelstadt and Luukkonen made Buffalo a B for me. 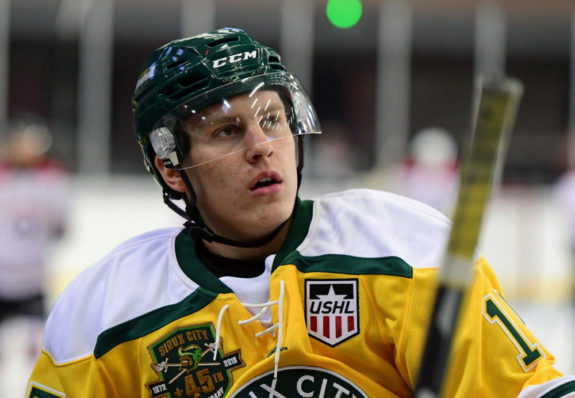 The Detroit Red Wings selected Michael Rasmussen at No. 9, a big centre who was always a contender to be taken in the top 10 but seemed to slip in the draft rankings after breaking his wrist in the second half of the season. 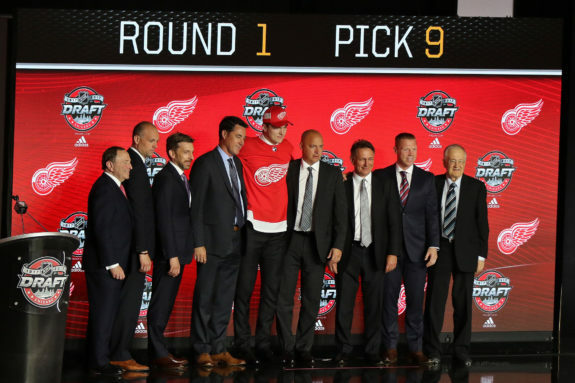 ANALYSIS: I only like three of Detroit’s picks — Kotkansalo, Petruzzelli and Setkov, not necessarily in that order. The rest left a lot to be desired, especially when you consider who else was available at those spots. Rasmussen wouldn’t have been my pick at 9 and Lindstrom wouldn’t even have been on my radar at 38, but the Red Wings do know their Swedes better than most, so perhaps Lindstrom will live up to that draft position in the years to come. Maybe he’ll be the next Nick Lidstrom. I just don’t feel Detroit made the most of its 11 picks, from start to finish. Thus the D.
The Florida Panthers took Owen Tippett, a goal-scoring winger, at No. 10 and had a strong overall showing. ANALYSIS: Low on quantity but high on quality. I liked my mock for the Panthers, but they did just as good and arguably better in reality. I don’t have a bad thing to say about Florida’s picks, aside from the fact that Repo is a total wild-card in the final round. Those first four picks were almost perfect and I don’t think I would change a single one. I really like Gildon at 66, with that selection ensuring Florida got an A. 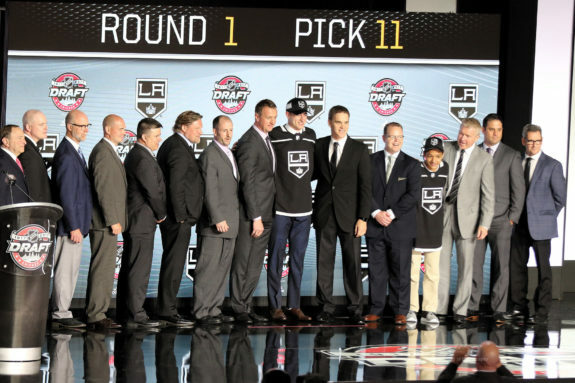 The Los Angeles Kings were thrilled to select Gabriel Vilardi at No. 11, considering he was a consensus top-10 pick leading up to the draft. ANALYSIS: Here’s another team that probably drafted better in reality than in my mock, but I still wish the Kings would have picked Ahcan and Menell (both undrafted) over Hults and Rymsha. I thought Villalta went ahead of schedule too. Enough complaining, though, because the Kings did come away with four terrific prospects thanks to Vilardi and Anderson-Dolan falling into their laps, while Anderson and Phillips were full value in those spots. Rob Blake’s first draft in charge couldn’t have gone much better, especially in the first two rounds, but I feel a B is fitting for the overall group. The Carolina Hurricanes selected Martin Necas at No. 12 and, ironically, his last name translates to “bad weather” in his native Czech language. ANALYSIS: I don’t love this draft for Carolina, but I don’t hate it either. I liked the picks of Necas, Martin, Geekie and Mattheos, but I felt that was a bit early for Luostarinen — even though I predicted the Hurricanes would select him. I was also right about picking a Finnish goaltender, but I would have preferred Ukko-Pekka Luukkonen at 42 or 52 (he went 54 to Buffalo) rather than Makiniemi in the later rounds. I’m not overly excited about De Jong or Rasanen either. I was thinking C, but Necas keeps Carolina in the B range, albeit just barely. The Tampa Bay Lightning really reshaped the future of their blue line in the month of June, acquiring Mikhail Sergachev from Montreal and then drafting Cal Foote at 14th overall. ANALYSIS: Foote is a rock solid pick, but the rest are kind of iffy. Tampa tends to be right about its Russians, so I gave the Lightning the benefit of the doubt to also avoid getting a C. Volkov and Lipanov will determine this draft’s ultimate grade for Tampa Bay, but I am intrigued by the three later picks as well. They all have potential to be steals, and Guttman is a kid who really grew on me in the months leading up to the draft. I feel that is a bit of a generous B-, but time will tell. The Calgary Flames already boast one of the league’s best blue lines — especially with the acquisition of Travis Hamonic — but Juuso Valimaki is another defence prospect to get excited about for the future. ANALYSIS: This seems like a harsh C, considering I like most of Calgary’s picks in those spots. I may have drafted a forward over Valimaki in the first round, but I like the player and think he’ll be a good pro. Ruzicka was free-falling at 109, so he was worth the risk. 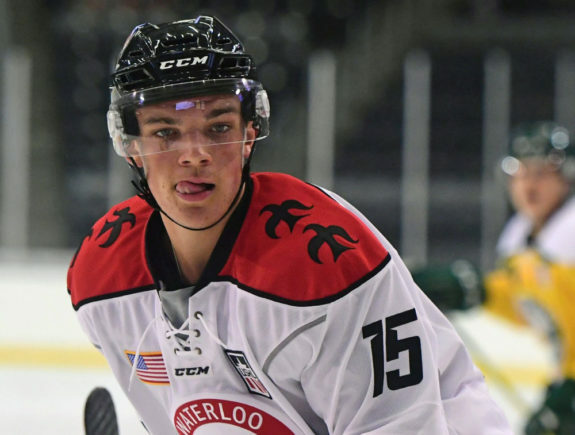 Fischer was more of a reach, but he could be the next Micheal Ferland or Lance Bouma or Curtis Glencross in Calgary. Joly and Sveningsson weren’t bad picks either, so maybe this should have been a B of some sort. 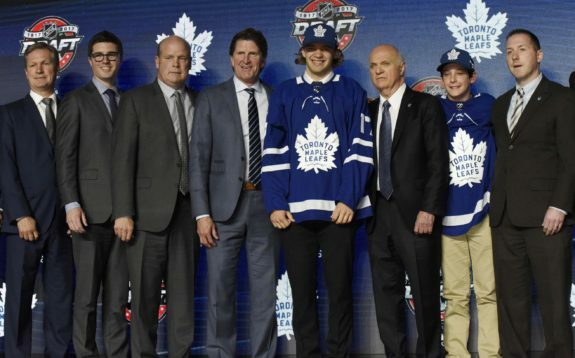 The Toronto Maple Leafs took one of the draft’s early fallers in Timothy Liljegren at 17th overall, a smooth-skating defence prospect who was touted as a top-five pick prior to the season and before being sidelined by mono. ANALYSIS: Bit of a strange draft by the Leafs again this year, a different kind of strange from 2016 and equally unpredictable. Another random Russian, but no Swedes beyond Liljegren, who fell to 17 despite being a consensus top-five pick a year ago. Two monsters for the blue line in Rasanen and Gordeev. Scott has significant upside as a goaltending prospect, but I’m not sure what to make of the two late Ryans. I’m honestly not a huge fan of Toronto’s picks, but if Liljegren becomes a top-five player from this draft, then the Leafs deserve better than a C. However, that’s the best grade I could give them as of today. 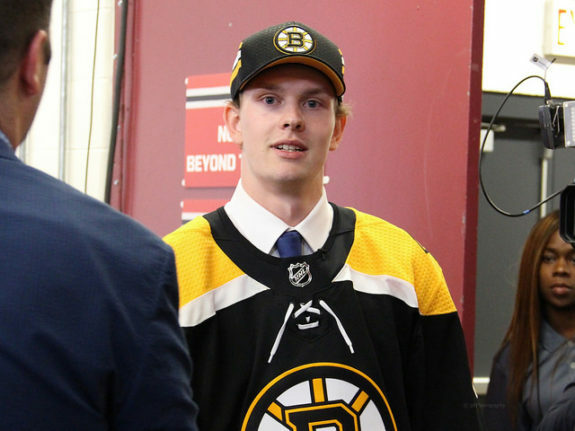 The Boston Bruins left some pundits shaking their heads by selecting shutdown defenceman Urho Vaakanainen at No. 18. ANALYSIS: What’s with the Original Six teams bombing in this draft? Well, the Bruins joined the Rangers and Red Wings in the D ratings. Boston already has an abundance of quality defence prospects and a relative lack of creative forwards coming up the ranks. No shortage of goalies already in the system too. This draft strategy just missed the mark, in my opinion. The prospects are fine for the most part — nothing exciting, yet nothing wrong with them either — but I would have gone in a way different direction if I were Don Sweeney. I’m not one to give out Fs immediately after a draft, but Sweeney’s scouting staff did fail this test. The San Jose Sharks drafted their share of American-born prospects, including Josh Norris at No. 19. ANALYSIS: I’m shocked the Sharks didn’t select a goalie — a position of organizational weakness, in a draft year considered strong at that positon — but I liked what San Jose accomplished overall. Ferraro and McGrew went a bit early for my liking, but the Sharks managed to get Reedy, Chmelevski and Chekhovich way later than I anticipated. Unlike in Boston, San Jose fans have plenty to get excited about here. This will be a fun group to follow next season. The crazy thing about my mock for the Sharks is that the last six prospects I had San Jose picking all went undrafted — yes, all six of them. Craziness! The St. Louis Blues used their second pick of the first round on a Russian wild-card in Klim Kostin, another top-10 talent that plummeted all the way to No. 31. 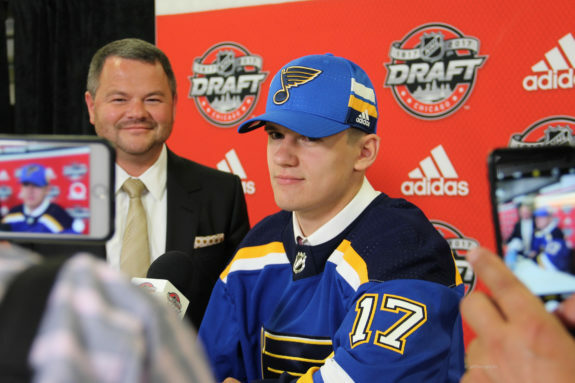 ANALYSIS: Really liked the first half of the Blues’ draft — the three forward picks — but really wasn’t a fan of the latter half, the defencemen. Kostin could be the steal of the draft at 31 and I still would have selected him ahead of Thomas, but getting both worked out well for St. Louis. It was a great first day all around for the Blues, who acquired Brayden Schenn from Philadelphia and turned tough guy Ryan Reaves into Kostin through another deal with Pittsburgh. I like that trade-off for Doug Armstrong. Drafting high-potential Russians like Kostin and Toropchenko makes sense since St. Louis made a long-term commitment to Vladimir Tarasenko. 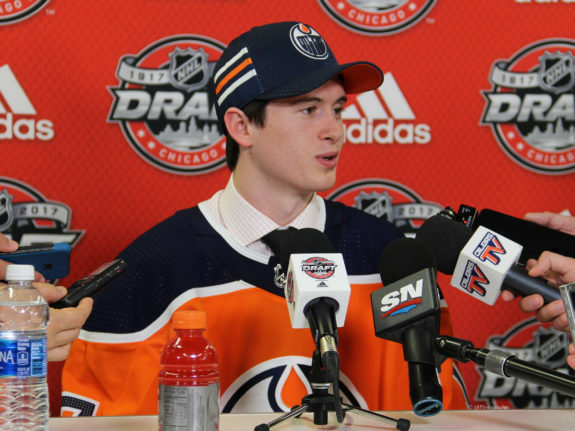 The Blues were getting an A at the midpoint but managed to stay above a C.
The Edmonton Oilers made Kailer Yamamoto the smallest first-round pick in NHL history at No. 22, but what he lacks in size, he makes up for in skill. ANALYSIS: Big fan of Edmonton’s first five picks and the final two were decent as well. I was one of many who predicted Yamamoto to the Oilers, and perhaps it was a lesson learned for picking the local boy, Tyler Benson, over Connor McDavid’s junior linemate, Alex DeBrincat, at the start of the second round last year. Like DeBrincat, Yamamoto is a small but super skilled forward who should be a good fit for Edmonton’s future forward group. Skinner is another local boy, but he gives the Oilers more depth in goal and could end up competing down the road with Dylan Wells, who is trending well since last year’s draft. Edmonton’s defence at the NHL level is still a work in progress, but the prospect cupboard is stacked with the addition of Samorukov, so the future is bright for that position too. If Safin and/or Maksimov boom, that grade would have to be upgraded to an A. Comparing draft positions to my mock, I had Safin at 38 and Maksimov at 90, so clearly I feel they could be steals at 115 and 146, respectively. 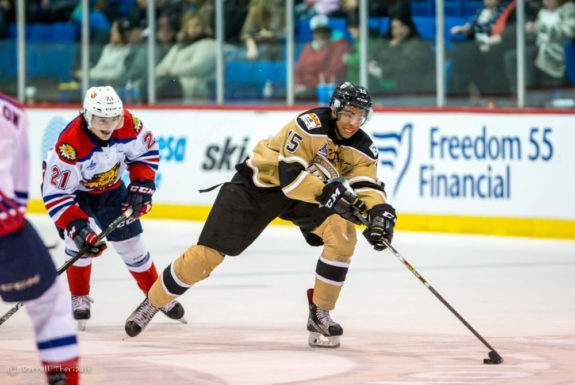 The Arizona Coyotes traded out of the top 10 to bolster their current roster but still had a pick in the first round to select Pierre-Olivier Joseph at No. 23. ANALYSIS: John Chayka did most of his improving on the trade front — acquiring Niklas Hjarlmarsson from Chicago, then Derek Stepan and Antti Raanta from the Rangers — and that meant moving the seventh overall pick, budding blueliner Connor Murphy and promising puck-mover Anthony DeAngelo. The Coyotes went defence-heavy in this year’s draft, with Crotty probably my favourite pick of the bunch. I think he could develop into something special. Joseph has a ton of upside too, but Westerlund seemed like a reach at 44. Hoefenmayer was a safer pick at 108, and Karow could go either way at Boston College. Entwistle, Schnarr and Steenbergen all appear to be good value in those spots, and Walterholm was a worthwhile risk in the final round too. There isn’t necessarily a signature pick for Arizona this year, but this group should produce enough NHL talent to warrant that B. The Winnipeg Jets went back to Finland in the first round, selecting power forward Kristian Vesalainen at No. 24 after landing Patrik Laine at No. 2 in 2016. ANALYSIS: I’m probably giving out too many Bs at this point — you get a B and you get a B (like Oprah giving away cars) — but I have to say Kevin Cheveldayoff and the Jets are piecing together one of my favourite prospect pools in the entire league, even if this year’s draft seemed a bit more hit and miss. I believe Vesalainen will be a steal at 24 — I had him at 12 — so Winnipeg got off to a great start. Samberg was a reach at 43, but unlike the other aforementioned reaches in the second round, Samberg has sky-is-the-limit potential. Kovacevic was off the radar for me, but the more I read about him, the more I think he’s going to be a player too. I was right about McKenzie to the Jets — joining Nic Petan and Chase De Leo as undersized Portland products with offensive upside — but I’m not crazy about Winnipeg’s other four picks. Those prospects could very well prove me wrong, but I felt there were better talents available at those spots. Getting Vesalainen without moving up was a win for Winnipeg, or enough of a win to stay in the B range. 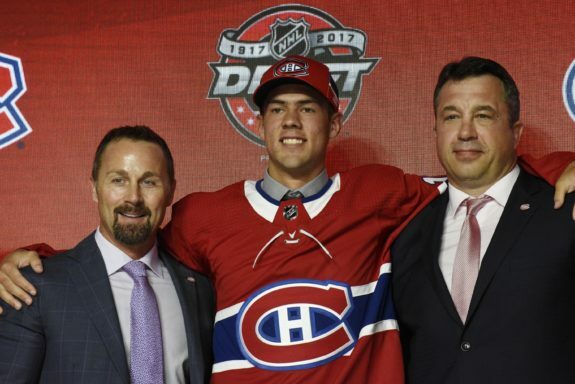 The Montreal Canadiens are looking for help down the middle now and in the future, and picked a quality centre prospect in Ryan Poehling at No. 25. ANALYSIS: I really liked my mock for the Canadiens, but I like the reality just as much, if not more. I’m familiar with those four WHL defencemen and I think they all have big-league potential, though Walford went higher than expected. I had Poehling and Ikonen going higher than they did, so I’m a big fan of those picks for Montreal too. Last but not least, Primeau could be a seventh-round steal and gives the Habs another quality goaltending prospect. Bravo, Marc Bergevin. You get an A. The Ottawa Senators also selected a centre at No. 28 in Shane Bowers, who projects as more of a two-way pivot with a solid all-around game. ANALYSIS: Not everyone can get a B and those As are hard to come by. This was likely going to be a mediocre draft for the Sens and that’s how it played out. None of those picks ‘wowed’ me. Bowers isn’t going to be as good as Colin White — Bowers is going to Boston University and White is coming out of Boston College, both drafted in the 20s. Formenton and Batherson were ‘meh’ ho-hum selections that didn’t move the needle for me. Hollett might be my favourite pick for Ottawa and I’m looking forward to seeing whether he can backstop Medicine Hat to the Memorial Cup being hosted by his former team in Regina. Mediocre is the key word here. 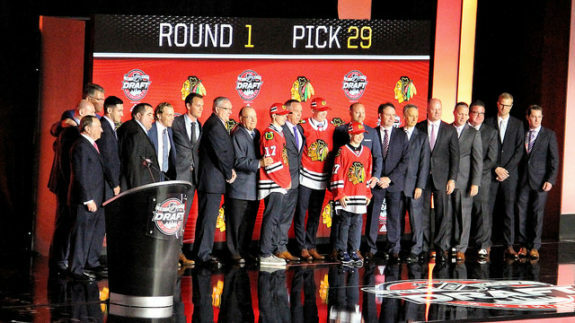 The Chicago Blackhawks were able to trade down a few spots and still select Finnish defenceman Henri Jokiharju at 29th, a prospect who was wearing a familiar jersey on draft day after developing with the Portland Winterhawks. 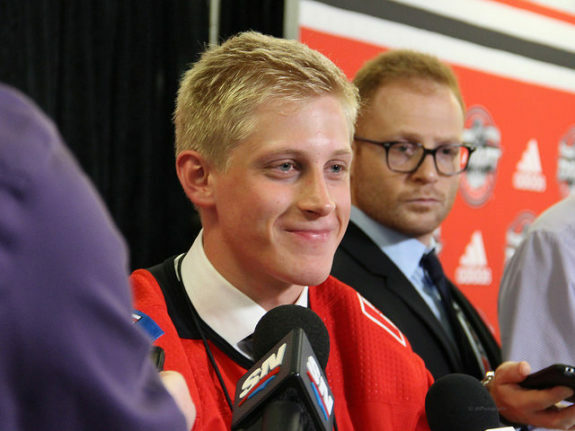 ANALYSIS: Back to the Bs, the Blackhawks drafted two mobile, Duncan Keith-esque defencemen off the start, then snagged three straight forwards with nice upside. I liked the Foo and Galvas picks too, but I wasn’t as high on Laavainen and Ess. Seven out of nine ain’t bad, right? I wasn’t blown away by any of these picks but, as is often the case, Chicago just stepped up and made one solid selection after another for the most part. 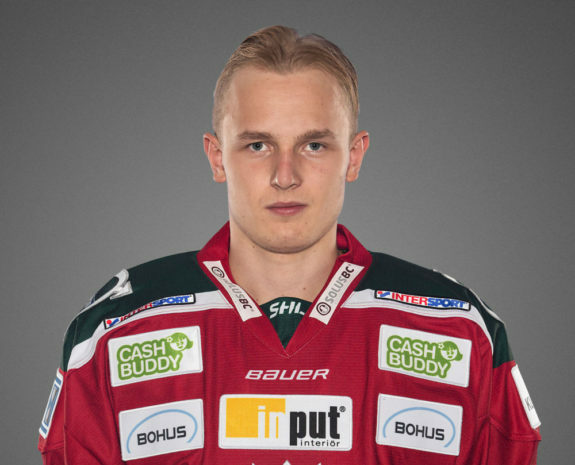 I sensed Jokiharju could be the Blackhawks’ first-rounder and I do see a lot of Keith in his skill-set. I was anticipating more Russian firepower for Chicago, at least before Stan Bowman surprisingly traded away Artemi Panarin to bring back Brandon Saad from Columbus. I didn’t like that deal for the Blackhawks, but the drafting was once again decent. The Nashville Predators prevented Eeli Tolvanen from falling into the second round, selecting the Finnish forward with the second-to-last pick of the first round at No. 30. ANALYSIS: Those first three picks were fantastic, and the next two could also be steals. I’m a big fan of Farrance — he was this year’s Adam Fox, in my opinion — and the Preds draft defencemen as well as anybody. I would have tried for another Viktor Avidsson in the seventh round — a boom-or-bust Swede or Scandinavian prospect instead of Paquette — but that is nitpicking. 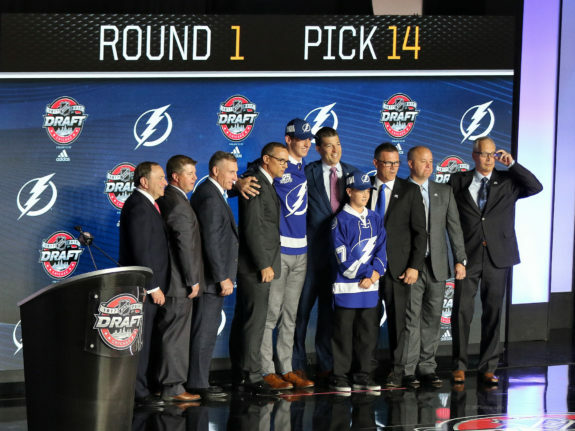 David Poile’s staff made the most of their late selections as a Stanley Cup runner-up, with that draft position making those picks even more impressive and worthy of that A grade. ANALYSIS: Jarmo Kekalainen traded up to take Texier — a real draft riser, according to most rankings — and then rolled the dice on Tarasov, who was a wild-card goaltender after losing most of his draft year to injury. If Tarasov rebounds, he could be a top-three goalie from this draft and a steal at 86. Meyer was a feel-good story, a Columbus kid getting drafted by the hometown team, which will only fuel his fire to make it. I like Bemstrom’s upside too, but I’m not sure what to make of Howarth, Davidsson and Stucker. If any of them pan out, the Blue Jackets probably get a B instead of a C for 2017. ANALYSIS: A lot of teams started strong, then tailed off. The Islanders were the opposite, in my opinion. Salo was growing on me as the draft approached and the Islanders got some good years out of Tommy Salo back in the day — no relation, as far as I can tell. Not sure he would have been my first choice at 46, but he may have been on my short list. Mirageas wasn’t in my top 100 (I had him at 125), so I felt he was a reach, but it got better from there for Garth Snow’s staff. Aho has long been a personal favourite and I forgot he was still draft eligible (thus the reason I never had him ranked as a 21-year-old), so I was pumped about that pick. Durandeau and Cockerill could be late-round steals too, so I felt the Islanders finished stronger than most. ANALYSIS: Bob Murray seemed to be going best player available and I liked that approach for Anaheim. It served the Ducks well in getting five quality prospects, some later than expected. Comtois was 2017’s biggest faller, once thought to be a top-five talent in this draft class, but he could bounce back and be a massive steal for the Ducks. I’m a bit surprised Anaheim took Badini over Henry at 91 — Henry, who went at 94, was a linemate of Ducks’ top prospect Sam Steel — but Badini lit up the USHL playoffs and was also deserving of a top-100 pick. Anaheim went out with a bang too, getting a legit goaltending prospect like Eriksson Ek with its last pick to join my long list of B grades. ANALYSIS: The Penguins strangely traded down out of the first round — to acquire Ryan Reaves from the Blues — then used a second-round selection from that deal to reach for a defenceman who most had pegged as a late pick. I didn’t even have Lauzon getting drafted this year, so to see his name come up on the board at 51 blew me away. Pittsburgh bounced back to pick Phillips and Drozg — two prospects that I’m fond of — but finished with three more questionable selections. For a team that typically drafts so well, the Penguins just barely avoided getting a D from me this year. ANALYSIS: I liked half of Minnesota’s picks — the first two and the gamble on Svetlakov. Misley and Swaney are two prospects I’m still getting to know, so maybe those selections deserve more credit too. Lodnia and Shaw are undersized forwards with a lot of skill. 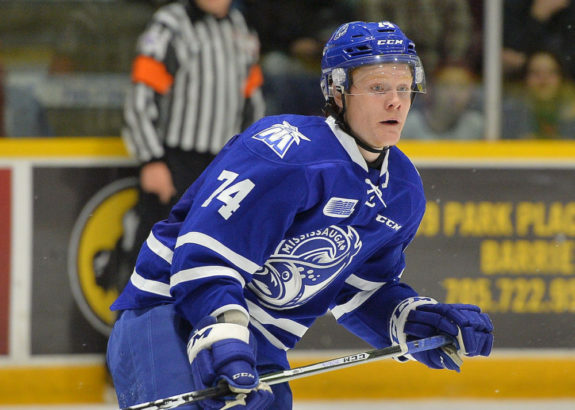 Lodnia struggled in the OHL playoffs or he likely would have been a top-50 pick. The Wild are already rich with forward prospects, which allowed Chuck Fletcher to be a buyer at this year’s trade deadline, but they added a few more with upside despite not having a first- or second-round pick. That lack of picks combined with taking on a couple projects resulted in a C rating. ANALYSIS: The two-time Presidents’ Trophy winners went all-in this season, again failing to get past the second round of the playoffs and subsequently paying the price at the draft. Without a pick in the top 100, the Capitals had no chance of adding an impact prospect and the players they picked all appear to be long-shots. 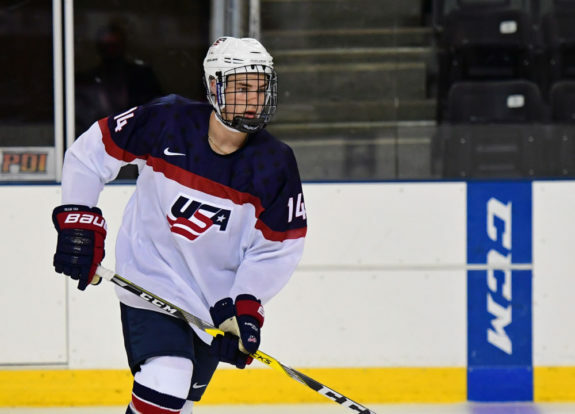 I predicted Washington would select Geisser, since fellow Swiss defender Jonas Siegenthaler is trending well for the Capitals, and Walfridsson was an OK pick too. Just OK. Maass and Roykas-Marthinsen weren’t on my radar and the group as a whole is definitely a D.